We have added 3 new and trendy classes to our Spring line up. ​Don't forget to sign up today! 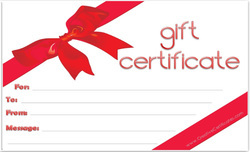 We have gift certificates all year round. Pick one up for a friend or loved one, or just treat yourself.